The Wacissa River is one of Florida’s wildest and most diverse rivers, with numerous springs and abundant wading birds. The river is a magnet for wildlife and a recreation hub for swimmers, snorkelers, boaters and anglers. This well-loved river offers rewarding excursions for beginning paddlers or families with children. The upper river can become crowded with boats and paddlecraft on weekends; the lower river tends to be quieter. For several miles below Goose Pasture, the Wacissa diffuses into several braids. It re-forms again just before flowing into a long sinkhole known as Half Mile Rise, part of the Aucilla River chain of sinks. 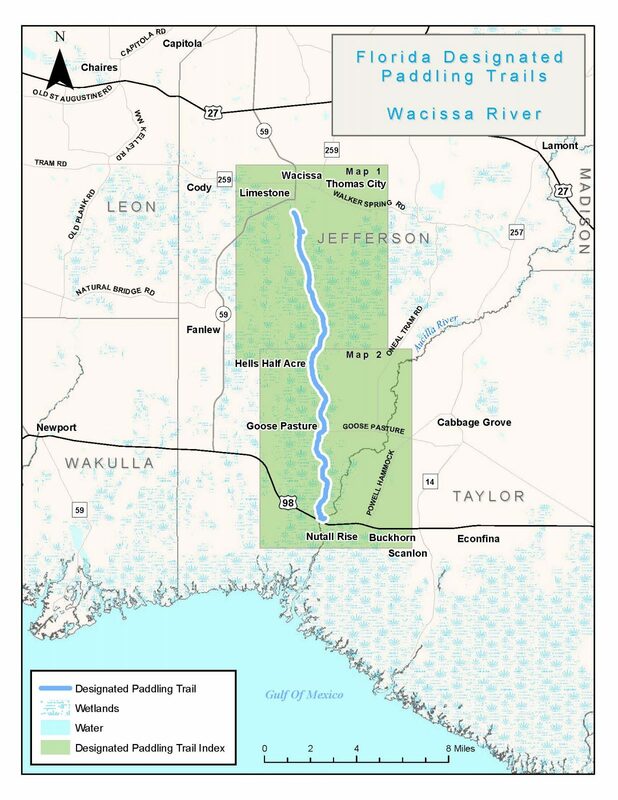 The Wacissa Slave Canal was constructed in the 1850s using slave labor in an attempt to connect the Wacissa to the lower Aucilla River so cotton barges could be floated to the Gulf. It largely followed a small natural stream. The canal scheme didn’t work well as the canal was too shallow, and after the Civil War it was abandoned for more efficient railroads. The hard edges are gone, and somehow the decades of rain, wind and water did not fill in the canal. Except for some boulders along the banks you’d never suspect it was not a completely natural waterway. The limpkin, now absent from many of Florida's rivers because of poor water quality and habitat loss, is still found on the Wacissa. Apple snails are this wading bird's main food source and clusters of the snail's pink, pearly eggs cling to aquatic plants and tree trunks along the water's edge. In the spring, zephyr lilies and wild irises brighten the landscape. In late summer, scores of swallow-tailed kites gather in the cypress along the river before their migration to South America for the winter. Dozens of wading birds hunt small fishes and frogs at the water's edge. Eagles, wood ducks, coots and mergansers are commonly spotted in the cool months. Alligators are plentiful all year. The following map and trail guide are provided courtesy of the Florida Department of Environmental Protection, Office of Greenways and Trails. Click here for trail guide and map.